This article is dedicated to giving you a broad overview of the technology behind our WebRTC live video streaming technology Flink. While OTT continues to be one the strongest growing segments in the broadcasting industry, there are still some open issues. This article gives you an overview of today’s problems with linear OTT broadcasting and how to overcome those problems. We designed it to cover three main topics, regarding P2P live streaming. How does the distribution of video content work? In this case, we use HLS as an example for the distribution of video content and talk about content delivery networks. We also show you the problems that already occur during the live transmission of content. Why using P2P live streaming technology? 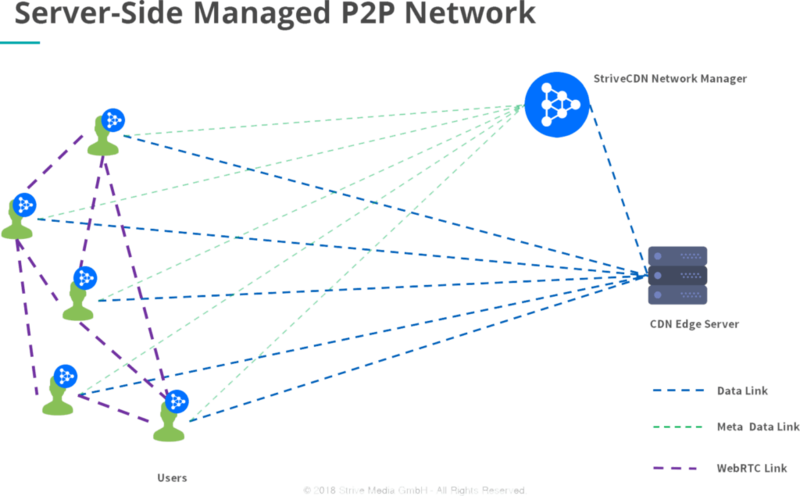 We show you how an on-top P2P network solution can help you reduce 60% traffic on your CDN. We talk about a P2P live streaming case study with over 60,000 concurrent viewers. You can check out real life results in cost reduction and quality improvement. HLS (short for HTTP live streaming) is a protocol used to deliver live video content from a streaming server to an end user. Once content has been created and uploaded, the streaming content is divided into segments. These segments (so called chunks) are of equal length, typically between 5 and 15 seconds. The segments’ URLs are then stored in a separate playlist file. A video player first downloads a playlist file that contains the segment URLs. Then, the video content is streamed segment by segment. The user’s device then assembles all segments and plays them back as a continuous live video stream. If you are interested in the technical details of HLS, read the awesome HLS Explanation by StreamingMedia. However, the distribution does not take place directly from the original server to the end user, but via one or more Content Delivery Networks (CDNs). Basically, CDNs are a huge network of servers, that store copies of original content in their respective cache. These so-called edge servers were originally developed to store and distribute static content such as images, websites. Today, CDNs also deliver static video files (VOD). The big problems occur when looking at live streaming. When there are so many users at the same time, not only the edge server gets easily overloaded but also the network between user and edge. While CDNs put a huge effort into expanding their infrastructure, the problem of network congestion still remains unsolved. This is a continuously growing problem for live video broadcasters. 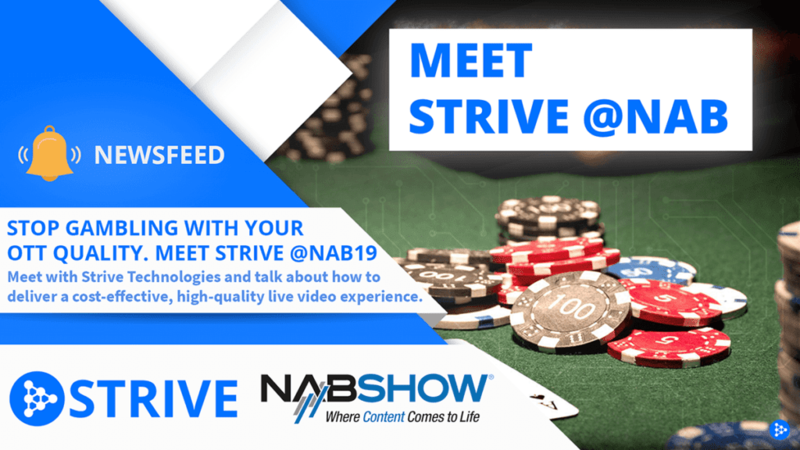 Here at StriveCDN we aim to develop the next generation of live video delivery. We believe that there are better ways to deliver live video content than just by using old school client-server CDN approaches. This is where our P2P live streaming comes into play. P2P Live Streaming - What Is Strive Flink And What Are Its Advantages? The concept behind StriveCDN Flink is to create a Peer-To-Peer (P2P) delivery network on top of the existing infrastructure in order to reduce CDN traffic. To achieve this goal, Flink uses WebRTC as a communication channel to build a distributed delivery network between connected devices that are streaming video content at the same time. This new network is then used to share video content between all viewers and build an ad-hoc video delivery network with unlimited scale and capacity. To keep control of this network, Flink comes with a centralized network management service that we call the Strive Network Manager. This cloud-service dynamically connects devices based on network and bandwidth information and keeps the connection to every single peer. It then instructs all peers to deliver data to each other, creating a zero-overhead, zero-delay delivery network on top of any existing (multi) CDN infrastructure. One of the big advantages is the reduction of traffic on the CDN Edge, which we achieve by sharing the required chunks over the p2p network. By redirecting through our P2P network, we achieve savings of 60% to 90% in peak times on the CDN side. A major improvement is a much higher bitrate and a significant decrease in rebuffering on the client side. With the ability to connect to a nearby peer rather than the distant CDN edge, there is a high probability that users with low performance will improve their overall connection quality and thus their own video quality. In our case study, we collected network and quality data from over 60.000 users in Cambodia, Thailand and Vietnam. So what are the results for P2P live streaming? CDN traffic that was expected by WebRTC network but was not received in time. Our P2P live streaming network shared over 72% of all traffic. We even reached a peak savings rate of 84%. In addition, approximately 14 GB of shared CDN traffic generates 60 GB of WebRTC traffic, quadrupling data provisioning and coverage with the same infrastructure and pricing. Only little more than 2% of all video segments had to be refetched from the CDN after not being delivered over P2P. The fallback mechanism prevents additional delays for users. Still, 98% of the time, a fallback was not necessary. The use of WebRTC has significantly increased the average ABR value. The main beneficiaries of this improvement were the low performing users. More than 12% of whom were able to achieve a higher quality level than ever before. Overall, Strive Flink increased the average bitrate of every viewer by about 36%. Our plan for the rest of the year is to give our customers more insight into quality metrics and real-time analytics and provide support for native streaming environments such as iOS, Android and Smart TVs. We are always interested in feedback, so please feel free to reach out to us via Live Chat, email or if you want to chat just meet us at this years IBC. Thanks for reading, have a great day and don’t forget to subscribe to our newsletter to stay updated with new content and information about P2P live streaming and Strive!